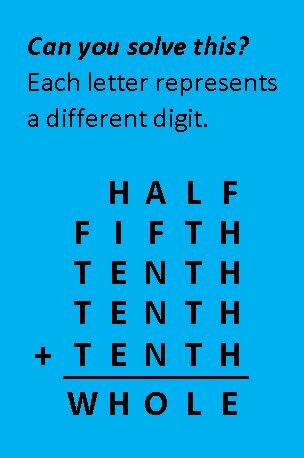 Yikes, Ten different letters for a 4 digit by 6 digit multiplication......... This can NOT be the first such problem. Recreational problems start out with simple ideas that people stumble across and find curious, and then expand to more and more complexity. For a modern, but challenging version, here is one I got from Dave Radcliffe@daveinstpaul in early 2016. No solution is offered, although he said he did it first by computer, and warned that "It wasn't so easy." If that sounds too tough, Dave says "I was inspired by HALF+HALF=WHOLE, which I saw on FB"
-It has more than one answer, so if you find one too quickly, try to figure out how many it has in all. (collect the whole set, send them in the comments ) If you have trouble with Dave's problem, you can look to the bottom of the blog.... or you can visit this site which is set up to solve these types of problems for you . The problem is generally called the "five rooms" problem, and the object of the puzzle is to draw a continuous path through the walls of all 5 rooms, without going through any wall twice, and without crossing any path. At least that is the modern version of the problem, (and not too modern at that, as this was the version I encountered as a student a very long time ago.).. But the earliest versions of the problem ask for it to be drawn with "three strokes of the pencil, without erasing any lines, or going over the same line twice. This is the same version Henry E. Dudeney used in his 1917 "Amusements in Mathematics", problem 239. I was surprised to see that Gardner's "Entertaining Mathematical Puzzles", 1961 also had this version under the title "Five Bricks" on page 77. In his "My Best Mathematical and Logic Puzzles" on pages 6 and 7 he calls it "Cross the Network" and it takes the form of the five rooms problem. Here is a slightly blown up copy for you to try. 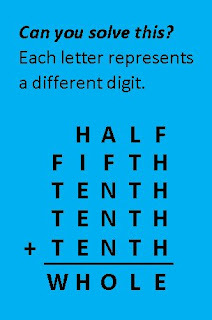 There are a number of these types of puzzles. Martin Gardner described them as one of the oldest of topological puzzles but gives no clear details on origin. I could find no references to the type of problem in David Singmaster's Chronology or Recreational Mathematics, but maybe it slipped my eye. Lewis Carroll (Charles Dodgson) like to give one that is possible to his young friends according to an old article in the Strand Magazine, 1908. Although it is sometimes attributed to Carroll, the author of the article says he "saw it in a little book published in 1835. He then contrasts the easy solution of Carroll's problem with what he calls "the old circle and square" problem, I assume because he believes it is older. If you have information about this problem in either form I would love information, links, or digital copies. Sometimes you come across things in old puzzle magazines that leave you stumped, as I di in this problem. An interesting, and probably challenging question for people in the US, A question in one of the 1860 editions asked, "What four US coins can be used to make a total of 51 cents... If you get stuck, I will post this answer a little lower down the post.. The solution of the problem of the four coins to make 51 cents was two quarters and two 1/2 cent pieces. The 1/2 cent coins were produced in the United States from 1793 to 1857. The half-cent piece was made of 100% copper and was valued at five milles, or one two-hundredth of a dollar.